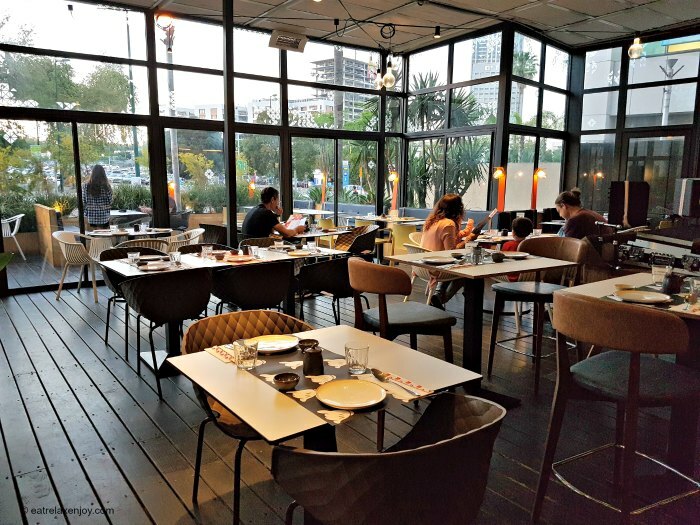 Amama is a modern Japanese restaurant that is adapted to the Israeli taste with a wide menu including sushi, starters, rice and noodles, desserts and a variety of alcoholic beverages. Amama is suitable for families and for business lunches, in the evening it turns into a dining place for the younger crowd with music. Amama restaurant is rather large and spans out to the (mostly covered) balcony. The décor is rather modern with a mix of colors and designer elements such as chairs with changing colors (white, wooden, cyan and beige). 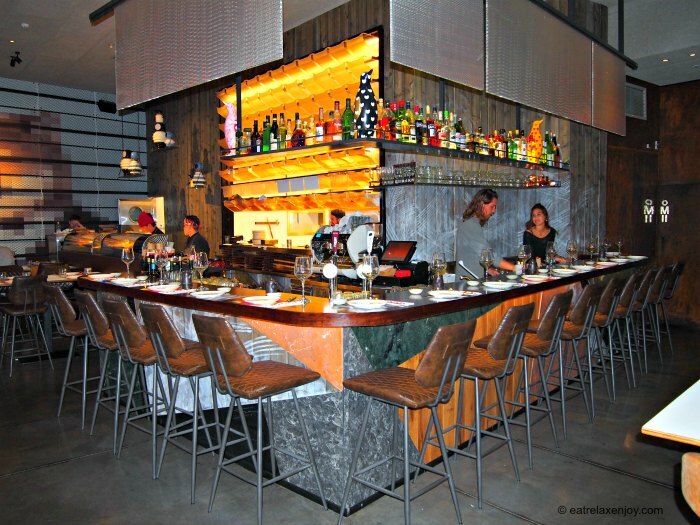 There is also seating on the bar. The tables have joyful patterns and colors. Amama’s menu is cheeky. It has a combination of funny names and offers a game of English and Hebrew. The beginning of the menu says HA YU SH and BA YU SH (the new ‘hi’ and ‘bye’ of the younger generation). The tempura claims ME TU GAN (which means fried in Hebrew), and so forth. 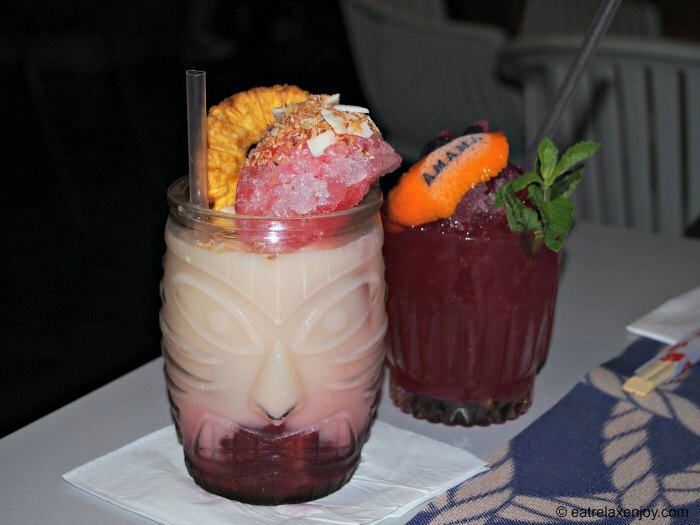 The names of the dishes are also funny, with “Mad Japanese” for Beef Entrecote starter, “Itri-Chicken” for chicken noodles, and “Captain Coco-nuts” for a Cocktail with coconut milk. The menu is the work of Yama San, who is from South Japan. He left to New York where he met his Israeli wife, and ended up in Israel. 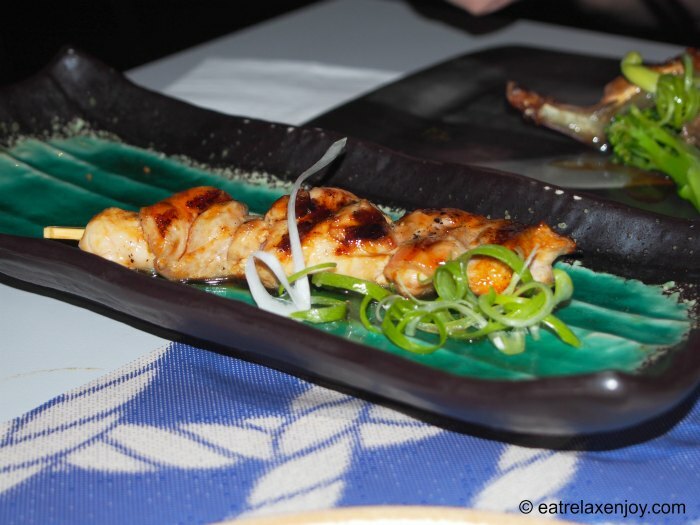 The menu is authentic Japanese but is suited to the Israeli taste and the local ingredients and fish catch. 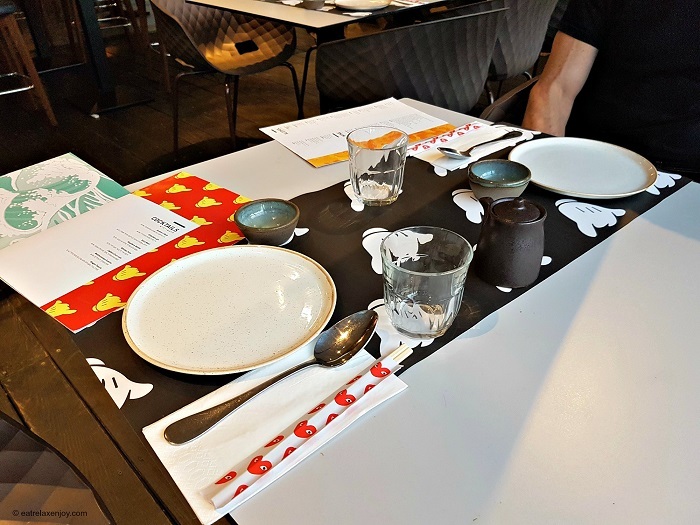 The food is very diverse and includes a huge variety of sushi, starters, including salad, vegetables, beef, chicken, different types of fish, seafood, rice, noodles, and desserts. We decided to have a meal of starters but skipped the Sushi this time. The starters are priced 18-56NIS. 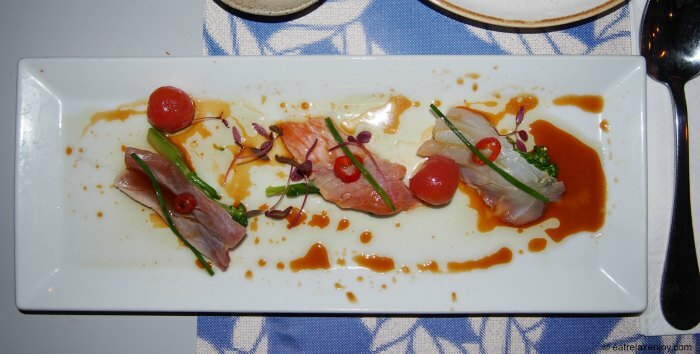 Tataki Mix – a plate of 3 types of fish, seared briefly in sesame oil, cherry tomatoes, asparagus and chili. A relatively small plate, but diverse and tasty, especially for those who can’t decide which fish to pick. The sauce has spiciness, but moderate. Chicken Skewer - a very soft small skewer of chicken in gentle marinade. Another plate for those who want a small portion or to have a variety. 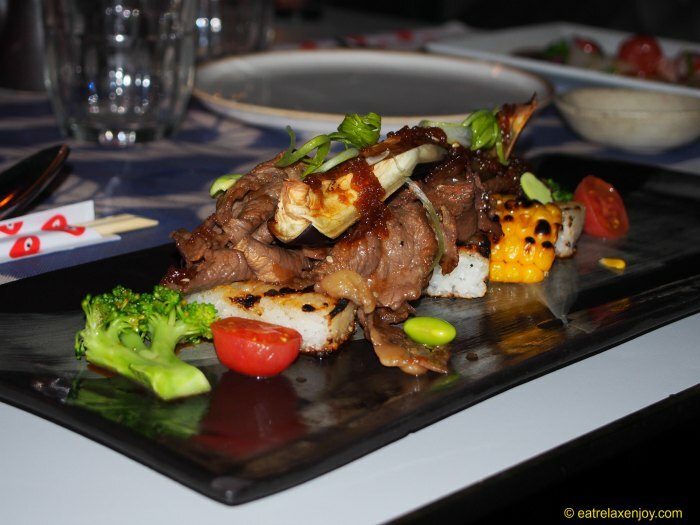 The skewers are served in singles, and are available with beef and Salmon as well. 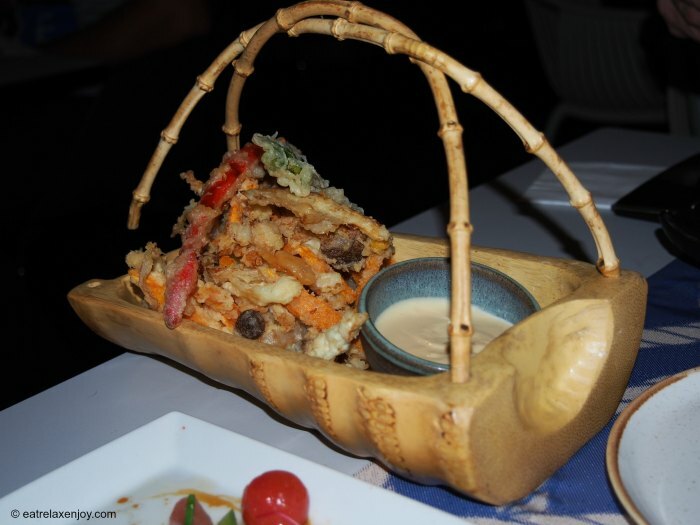 Mad Japanese – a really fantastic dish! A combination of entrecote seared rice squares, eggplant, cherry tomatoes, broccoli and chives, with chili, white sesame in Yakiniku sauce. We loved every bite of this wonderful dish! Yama’s Fries/VEG – a mix of potatoes and vegetables fried in tempura. If you must have some “junk food”, it is a really yummy dish, served with Tartar sauce. The pepper can get really hot so be careful! Tuna Tartare – a dish of three squares of fresh tuna fish, served on seaweed on a pile full of ice to preserve freshness. 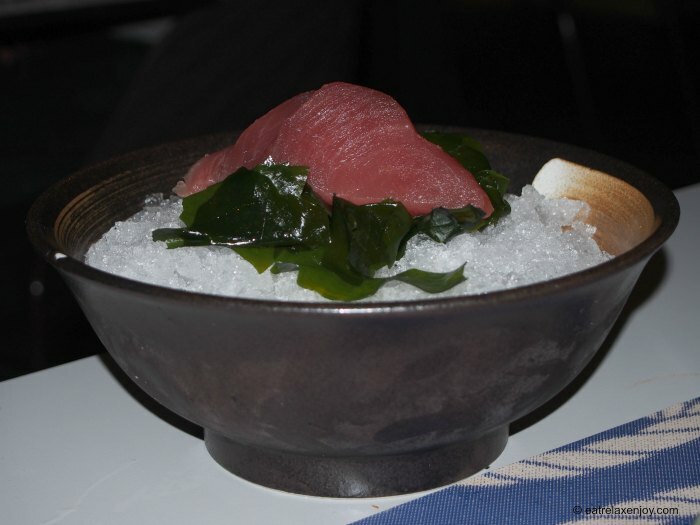 It is very fresh tuna with a typical odor and taste; I dipped it in soy sauce. Amama offers a few Mediterranean desserts like Malabi, pistachio crème Brule, Chocolate Cremo, but also cold fresh fruit soup with mango sorbet (38-42 NIS). We ate two with hot drinks (there’s quality coffee/tea). 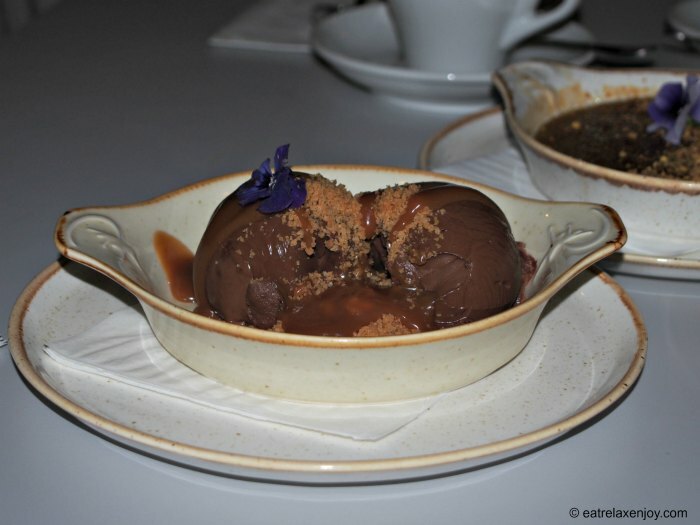 Chocolate Cremo – Caramel Miso and Streusel. Two balls of chocolate Cremo on a layer of Streusel covered with caramel cream. Rich and tasty! 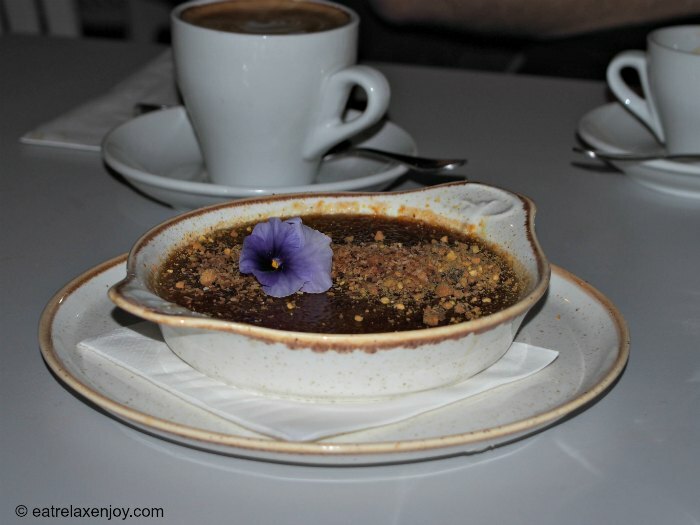 Pistachio Crème Brule – a dessert that may not be as photogenic but is sooo yummy! The crème has a lovely greenish color and is not too sweet, which fits well with the crunchy caramel layer – wonderful! Amama has a number of refreshing cocktails (36-39 NIS). We had two, both beautifully served, especially Captain Coco-nuts (mentioned earlier)! 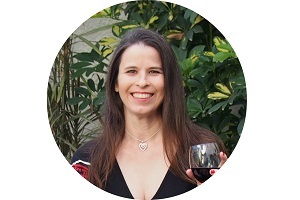 There is also a variety of wines. Raspberry Mohito - Captain Morgan spiced rum, forest fruits and mint. Captain Coco-nuts - Captain Morgan spiced rum, pineapple, strawberry and coconut milk. Thick and sweet! 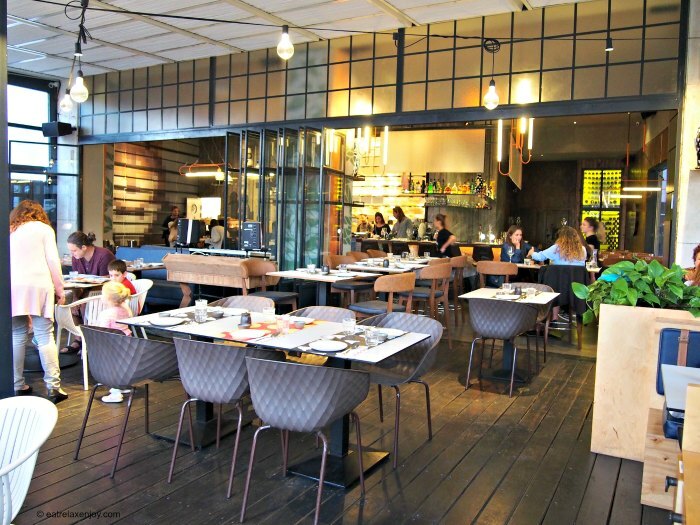 Information: Amama, 34 Habarzel, Ramat Hachayal, Tel Aviv. Disclosure: I was a guest of the restaurant.